MSKeyViewer Plus is a portable free key finder program that's easy to read and can find the product key for a large number of programs. Advanced features can be accessed through command line switches. This review is of MSKeyViewer Plus v2.5.0. Please let me know if there's a newer version I need to review. At first glance, MSKeyViewer Plus looks like it has lots of options and settings, but there's essentially just one thing you can do, which is copy out product keys. Programs are listed in their own section to make room for several programs to display at once. You can expand any of the programs to view the product key, service pack level, and product ID. You can copy all three of these things out of MSKeyViewer Plus at once but you unfortunately can't copy just the product key. The About button has a whole list of the supported programs, which includes things like popular antivirus software and some Adobe products. 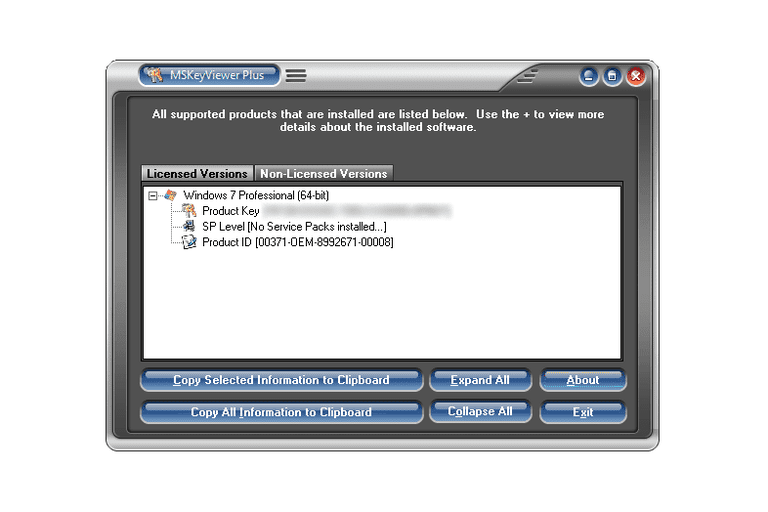 Some key finder programs let you connect to a remote computer to find its product keys. Also, similar programs can export the list of product keys to a file. MSKeyViewer Plus supports these two abilities but you must access them through command line switches, which can be confusing. More information about using these advanced features can be found on their download page. Most key finder programs that support Windows 8 will display the correct product key information, Belarc Advisor and ProduKey being two examples. Unfortunately, MSKeyViewer Plus doesn't. When I tested it, the program opened in Windows 8 and appeared to work just fine, but the product key for Windows and Microsoft Office 2013 were truncated, making them useless. Try a different free key finder program or maybe even a premium key finder tool if this one didn't have the features you want or couldn't find the key you're after.